The atmospheric shudder of tremolo has inspired guitarists of all genres for over half a century. Indeed, in the form of the DeArmond Tremolo Control launched in the early 1940s, it was the first commercially produced guitar effects unit. 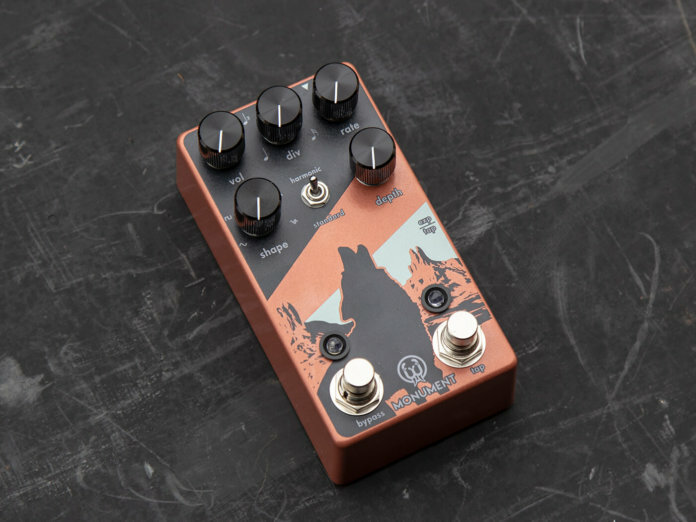 In the decades since, hundreds of tremolo pedals have hit the market, offering wildly differing levels of sophistication, from Cro Magnon to Cape Canaveral – and this updated version of Walrus Audio’s Harmonic Tap Tremolo veers sharply toward the latter, promising a wide range of textures and functionality to explore. Rate, depth and volume knobs make up the bare minimum for a tremolo pedal these days, but as well as these, the Monument sports Shape and Div controls, a side-mounted expression/tap pedal input jack, two footswitches (bypass and tap) and a Harmonic/Standard mini toggle switch, enabling access to the pedal’s two voices. 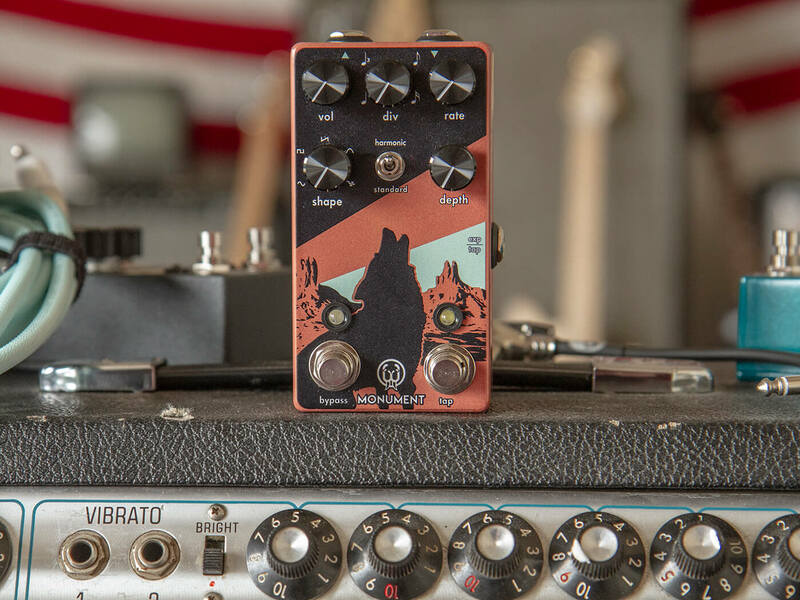 Experimentation with the Standard/Harmonic switch quickly reveals the Monument’s versatility. Like a vintage Blackface Fender amp, the Standard voicing is based on a sine wave, and in this case much of that lush, evocative sound is reproduced very effectively. Harmonic tremolo, however, is pretty rare in pedal form, offering grittier textures usually associated with old Brownface amps. Selecting this voice embellishes both chordal and single-note work with beautifully nuanced, almost phased movement. The thoughtfully provided Shape knob enables the player to exercise, or indeed relinquish, control over the waveform used. While sine and square settings are commonplace (albeit well executed), the Monument offers more esoteric delights in the form of ramp (think Leslie), lumps (think lumps…) and the eponymous Monument setting, which is a random combination of all of the above. The Division knob sets the multiplication factor used to multiply the tempo set by the tap switch. While this level of functionality is common on delay pedals, it’s rarely seen on tremolos. The divisions on offer are quarter, triplet, eighth and 16th notes, which should meet all but the most demanding tremolo-based expectations. 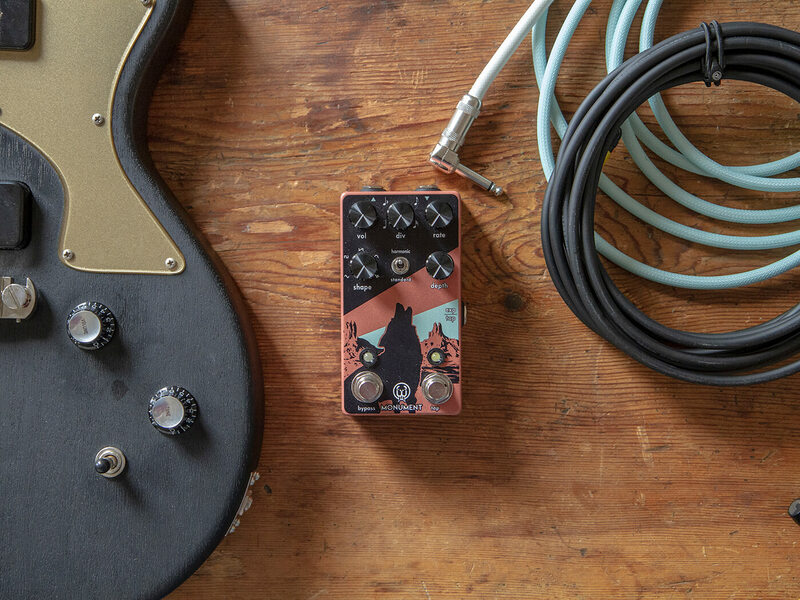 The Monument’s input and output jacks are mounted in a pedalboard-friendly manner on the top of the enclosure, making room for an expression-pedal input socket. While this could be used for an auxiliary tap-tempo switch (you have to flick a switch inside the pedal enclosure to do so), it’s difficult not to see that approach as a bit of a shame compared to the world of temporal happiness that opens up when you add an expression pedal. It’s certainly interesting to note that on the previous, larger, iteration of this pedal there were jack sockets for both these options. 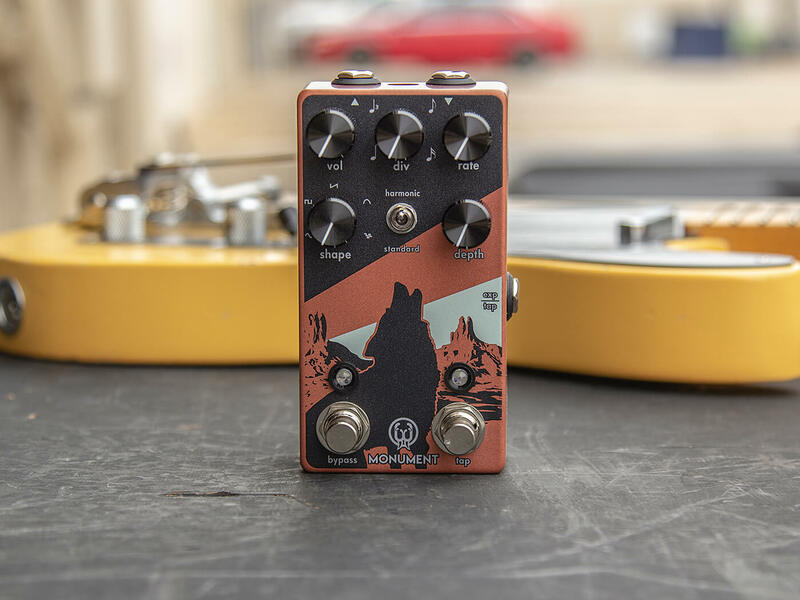 Any perceived compromise, however, is readily forgiven when we discover any of the Monument’s five knobs can be assigned to your expression pedal – as opposed to simply the rate, as on the first version. This, in conjunction with the momentary switch, grants instant access to some extremely high-quality textures from subtle shimmers to ray-gun screeching and extreme, chaotic throbbing. Nice. A sophisticated take on some classic and contemporary tremolo textures, with boutique quality to match.